SATURDAY, July 2nd-Freedom is never free and the price of freedom is not something you pay just once. It’s something we often take for granted, especially if we were raised in this country and never have known anything else, worn with the comfort of an old shoe that’s well broken-in and easy to slip on. We celebrate it every year on the date known for the signing of our Declaration of Independence, July 4th, and often we commemorate it with fireworks, barbecues and family events but do we ever stop and think about what we are celebrating and what went into making that an event worth remembering? The signing of the Declaration by representatives of the thirteen original British colonies was probably the easiest part, even though it was the culmination of a lot of debate and discussion in the months that led up to the signing. Not everyone there wanted to give up their citizenship and their ties to Great Britain or their allegiance to a King that came from an unbroken line going back centuries. Others were fed up with being under the thumb of a government that was a month’s travel removed by ship from the lands they had claimed and tamed since the first pioneers had stepped foot on the shore. These were the people who had never seen their mother country, the second, third and fourth generations of the original settlers, who felt the great philosophical and cultural divide between the lands. Settling the debates and discussions may have seemed insurmountable to the delegates of Georgia, South and North Carolina, Virginia, Maryland, Delaware, Rhode Island, Pennsylvania, New York, New Jersey, Massachusetts, Connecticut and New Hampshire but after much give and take, the decision was made, the die was cast and John Hancock put the first signature on the document. Saying things and doing things are two entirely different things though. Once the decision was made, there was no turning back and every man who signed it knew that by the law they were a traitor and the first heads that would hang would be their own if they couldn’t achieve the independence they sought. The country prepared itself for the coming storm and that storm would be red. At that time in the world, there was no army mightier, better equipped and better organized than the British Army and they had the finest Navy in the world to back them up. They were not about to give up the almost unlimited resources, abundant land and wealth that America contributed to His Majesty’s Treasury without a fight and that is just what they came to do. The Continental Army, under the command of George Washington, was mostly made up of farmers, tradesmen and a handful of gentlemen aristocrats, few of which had ever served in any kind of organized army. They lacked discipline, equipment and numbers but they had advantages that the British Army lacked-they knew the land they were fighting for and they used it to their advantage every chance they could. They developed new ways to fight the enemy and they attacked him at every opportunity. They lost battles and they won battles and though each one took a toll on them, they drew from an inner strength and resolve that few today could understand. For the next five years they would fight and they would hallow the ground of many places whose names are familiar to every American today: Boston, Bunker Hill, Yorktown, Lexington, Concord, Trenton, Princeton and many others. We didn’t do it alone either. France was a major player in our Independence and Spain helped finance American munitions and supplies. Britain relied on the help of thousands of German soldiers hired and paid out of the treasury to swell their numbers but in the end, soldiers who fought for pay could not match the fighting spirit of those who fought for their homes. Ultimately we prevailed and America became ours to govern. What have done with it since then? We became a beacon of freedom for other countries to follow. We became the land of opportunity for any American who wished to work hard to succeed and we opened our shores to those who wanted to join with us and have the opportunities we enjoy. We took our place at the world table and for a long time, we sat at the head of that table. We fought those who would bring aggression against us and we fought each other over state’s rights and moral issues…..and we joined with other countries, not once but twice, to prevent the world from being dominated by evil. We didn’t pay for freedom once; we paid for it again and again, not just with money and resources but with human blood and sacrifice. We sent our sons and later, daughters off to war and oftentimes, war sent coffins back. Through it all, we offered the dream of America for those who wanted it and who would follow the right path to get it. The 4th of July is Independence day. It is not about barbecues and family reunions. It isn’t about fireworks or flags, although they all mark ways we celebrate it and they are American traditions. It’s about marking the first time that many of our ancestors stood up for the first time and said to the world that we would be our own country and govern ourselves. We would claim the right to choose the people who lead us and we would have the right to say what we want to without fear of reprisal. We would own and work our own lands and we would fight anyone who tried to take those rights away from us. America is so much more than a flag you can touch or land you can toil over-it is a concept of freedom that is shared by millions of its citizens, promoted by them and defended by men and women who wear the uniform of our country and stand guard over us night and day. It has been bought and paid for by the blood of both soldiers and civilians but it is something we will always be making payments on because there will always be those who want to take it away from us, who fear it and who will do anything to stop it from spreading. These are the things that we have to keep in mind as we celebrate our 235th birthday together and we need to pause and remember all those who paved the way to that birthday. When we see our children waving their flags, we should think about that flag that flew over Fort McHenry in 1814 that inspired the words to our national anthem. When we see the fireworks shooting a thousand feet into the sky, we should think about cannons that fired in the Revolution, the Civil War and our two World Wars, among many others. When we hear the sounds of firecrackers popping, we should think of the soldiers who went into battle armed only with a musket rifle that they could load and fire at best three times a minute. They are symbols of the cost that freedom carries with it and must never be forgotten or taken for granted. Finally, we should remember that everything we have was built on the backs of those who came before us and we must always strive to make sure that what we build will be strong enough for those who come after us. 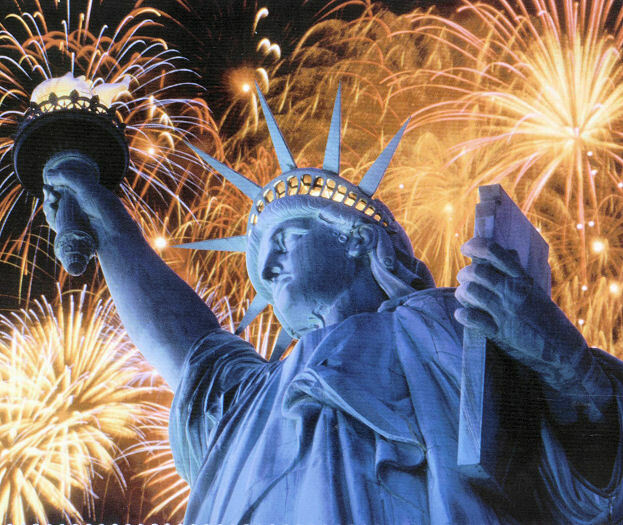 Happy Birthday America and may you always be the land of the free and the home of the brave. The Literate Pen now has a Facebook Page! Click the link in the right column to “Like” it on Facebook!